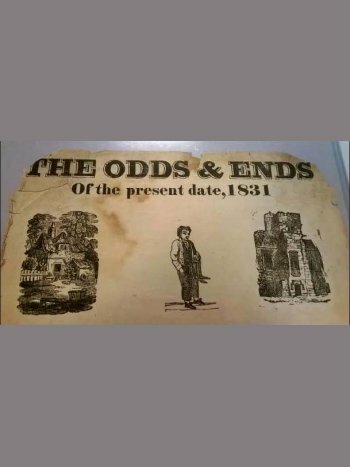 “The Odds and Ends of the Present Date, 1831” is a broadside printed in 1831 by central London publisher J.V. Quick. A broadside, also known as a broadsheet, is a single, long sheet of paper featuring text in vertical columns, often with attention-grabbing woodcut illustrations on one side of the page only. 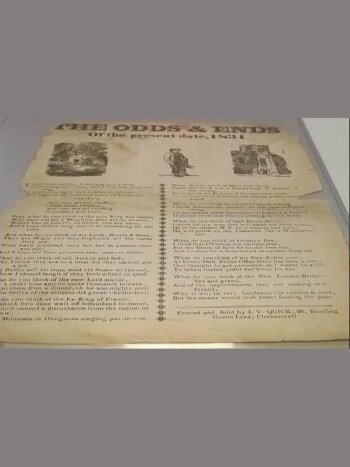 Broadsides were useful publications during the time of the wooden press because they required little ink, paper, or assembly. 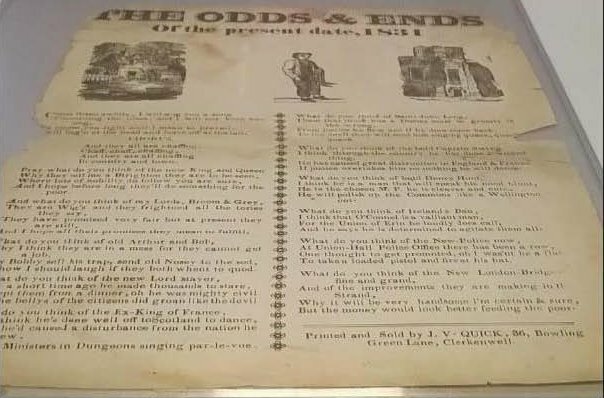 Although broadsides are rare today, modern newspapers still use the same large-sheet format inspired by them. In the eighteenth century, it was popular to use broadside printing for ballads. These ballads provided commentary on politics and social happenings of the time, such as in this document. 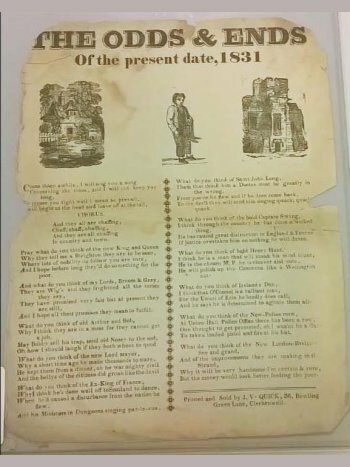 This broadside offers a humorous critique of political and social figures of 1831 in a whimsical, rhyming ballad. The name of the author is purposely not published to avoid conflict or confrontation over controversial political views. 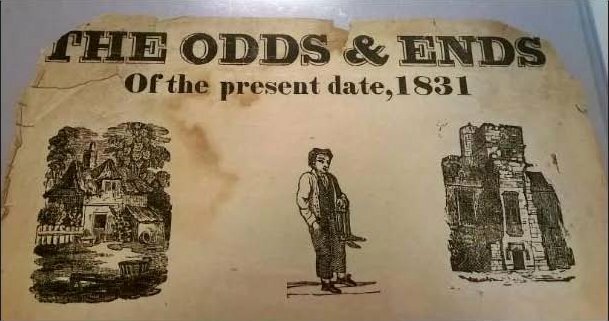 This sheet was probably posted somewhere public for passersby to read, so that the average, middle-class Briton could catch up on gossip of the day in a humorous way. 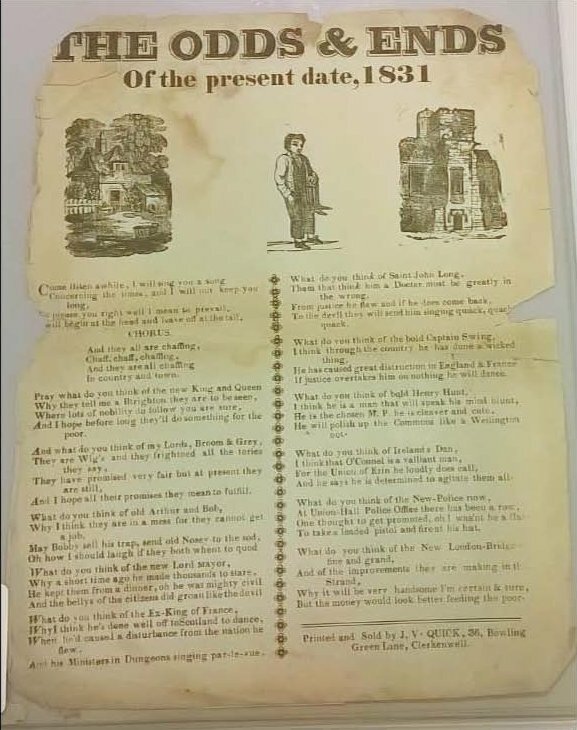 This broadside offers amusing commentary on English King William IV and his Queen Adelaide, Prime Minister Lord Earl Grey, Sir Robert Peel, Arthur Wellesley, Alderman Key, French King Charles X, quack doctor Saint John Long, Henry ‘Orator’ Hunt, Irish nationalist leader Dan O’Connell, the Metropolitan Police Act of 1829, and the construction of the New London Bridge.